twentysomething women as they search for love and purpose. Annie Jones is trying to put her big love, Sullivan, behind her, and squash her demons of anxiety and compulsion. In a post-fest funk, she and her more worldly sidekick Isobel jump in Annie’s 1972 Volkswagen Beetle and race across the country to Montreal where her real-life fantasy man, Hawksley Workman, is doing a gig. A year later Annie and Isobel end up back at the folk festival, this time in a much different position—on stage. 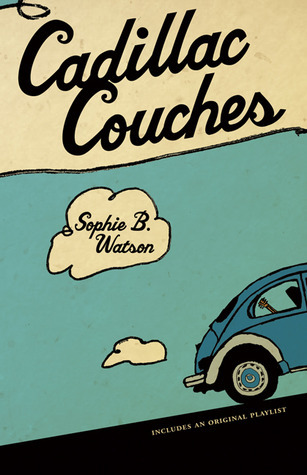 A witty first novel, Cadillac Couches is a story about finding one’s holy grail in life. The book comes with its own playlist/soundtrack. Cadillac Couches is pretty stellar. You know when you’re reading something so genuinely good, unexpected, so perfect-for-your-now that you feel like you’re going to fly out of your head? I felt that way when I first read Megan McCafferty, Jaclyn Moriarty, Susin Nielsen and Elinor Lipman (among others)….and I felt that way when I was reading Cadillac Couches. Through the slightly hazy and anxiety-ridden eyes of twenty-something Edmontonian Annie Jones, we’re taken on a whirlwind cross-Canada adventure. An adventure that somehow manages to be a road trip novel; coming-of-age journey; ode to Canadian music festivals; exercise in exorcising past relationships and mistakes; and tribute to friendship- all in one kick-in-the-pants beautiful novel. I loved Annie’s (and Isobel and Finn’s) story, and I can’t get over the fact that this is Watson’s debut novel. I hope a lot of readers- lovers of contemporary fiction and lovers of Canadian fiction alike get a chance to read this. And for YA readers interested in more sophisticated and realistic coming-of-age books that focus on the oft-forgotten twenty-somethings? This is a great pick. This novel has a blend of Will Ferguson-like love/despair of Canada, with the contemporary zing of writers like Susan Isaacs, M.A.C. Farrant and Susan Juby. But Cadillac Couches is entirely its own being and I highly recommend getting to know it!